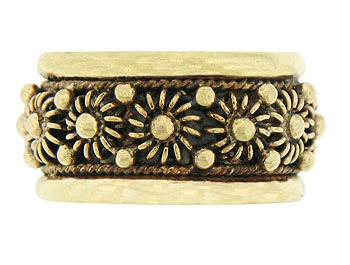 Whimsical figural blooms dance across the surface of this 14K yellow gold vintage wedding band. Bold milgrain presses into the center of each blossom and punctuates the darkened surface between each flower. 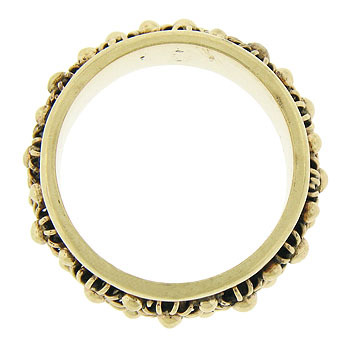 Twisting ropes of gold frame the central design while the edges of the ring are finished in wide, faceted bands that have been polished smooth. 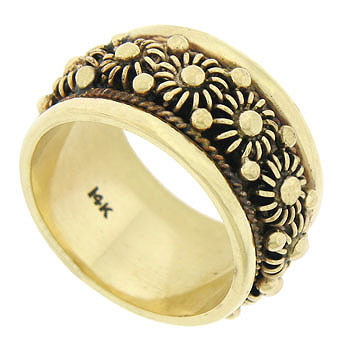 The Retro Modern wedding ring measures 11.32 mm in width. Circa: 1940. Size 7 1/4. We cannot re-size.